Do you suffer from a clicking or popping jaw? You are not alone. 10 million Americans (mostly women) are dealing with the pain of a dysfunctioning temporomandibular joint (TMJ). Current treatment for a TMJ deals with the symptoms without actually fixing the damaged tissue. But new research out of Columbia University Medical Center (published in the journal Nature Communications) suggests there is a better answer — and it lies in the stem cells already present in your jaw. TMJ dysfunction occurs after damage to the cartilage within the jaw. 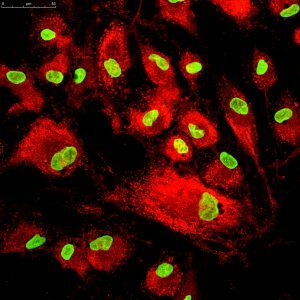 Following injury or disease, the cartilage does not regrow — but the new study of mice showed that by manipulating the stem cells in the damaged jaw, cartilage and bone could be spontaneously generated to repair the TMJ. That’s big news for people suffering from chronic jaw pain. As anyone with TMJ knows, a dysfunctioning jaw can cause severe discomfort upon opening and closing the mouth. It may cause difficulty eating and speaking, too. Previous treatment tries to realign the jaw, take pressure off the joint, or merely soothe its ache. So far, nothing has been able to solve the actual problem of damaged tissue. It’s important to note that the study deals with stem cell manipulation rather than transplant. Entering new stem cells into an area — transplantation — can present risk for infection or even encourage the growth of tumors. Manipulation offers a safe, effective alternative for cartilage regrowth. Read more about the new study to learn about stem cell science. While the discomfort is difficult to ignore, you may be dealing with TMJ pain without realizing what’s at the root of the issue. Learn how to recognize a problem in your jaw to find some relief. TMJ is more common in women than in men and is also accompanied by nighttime teeth grinding. If your partner observes you clenching your jaw or grinding your teeth during sleep, or if you have any of the symptoms of the jaw disorder, consult your doctor to discuss TMJ problems. You can also try to remedy an aching TMJ naturally. Because jaw clenching and teeth grinding is often caused by stress, try to reduce tension by exercising, meditating, or trying out talk therapy. Placing a warm compress on your jaw joint at night before bed can also help to reduce teeth clenching and grinding. Dr. Koo and Dr. Weil at Piney Point Oral and Maxillofacial Surgery keep up-to-date on the latest advances in TMJ treatment, and they are encouraged at this news of stem cell manipulation for providing relief to people suffering from painful jaws. If you are currently suffering from a painful or clicking jaw, you deserve relief. Please get in touch with us to discuss your treatment today! by: Dr. Steve Koo at October 20, 2016 .